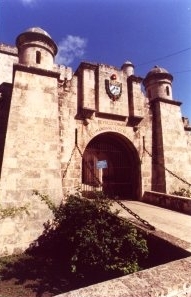 San Antonio de los Baños - Havana Prov. On November 17th. 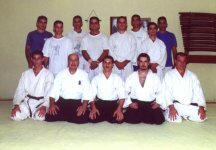 Professor Ricardo López has been in Cuba invited by Dojo del Ariguanabo, of San Antonio de los Baños, Havana Province, and the new dojo in Bauta. He took along one´s of his disciples, Rodrigo Colosimo. They visit traditional tourist sites of this beautiful country, and others interesting places. 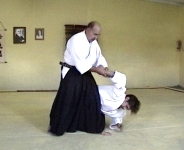 During theirs stay that last seven days they had a prolongate and intense practices, sharing experiences, technical aspect and Aikido philosophy. 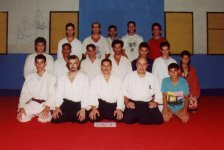 This trip also served the purpose for a more close friendship that Shimbu-kan Argentina sustain with Dojo del Ariguanabo since its birth. On 24th. a farewell party was given in a country house with the assistance of a great number of participants. In the ocassion professor Ricardo López received a diploma, a beautiful card and a present as a token of his visit. He took the opportunity to express his gratitude with the promise of a new visit. 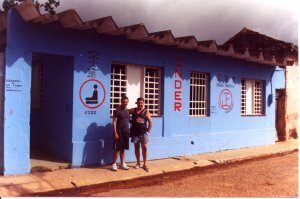 From this page we sent our appreciation for their care and friendship received to Professor Alfredo Ruiz Fleitas and Sempai Rafael Benítez López.